- Bags are packed in pieces of 100. 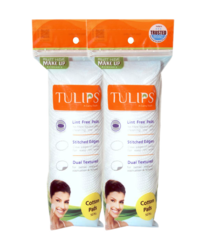 - The cotton significantly increases absorption capacity & keeps the wound dry. - Combine dressing pad are especially recommended for dressing of high critical wounds. - 100% Pure Cotton. Softness Guaranteed! 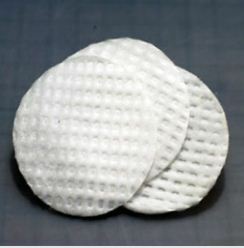 Cotton facial pad is used mainly for the cosmetic purpose. It can also be used for medical purpose to stop or prevent bleeding from minor punctures such as injections or veinpuncture. Its very light weight, optimum porosity and cost effective. Available in packs of 100 pads in colourful bag. Our hard working ladies needs a special massage to escape from the stress & tension of a challenging and an ever demanding day. These facials pads are……..
• Exfoliates, deep cleanses, removes dead cells & improve blood circulation. • Conditions your skin naturally. • A must use for make up removal thus giving a healthy natural glow. Super fine silicon pad This little buffer pad is useful for facial fuzz on the upper lip or a silky finish on the bikini line. This quality is produced only out of High Quality Comber Noil Cotton to retain its’ softness. Avera Cotton Pads are multi-purpose and can be used for applying makeup and removal of make-up. The pads have interwoven cotton layers for extra softness. Ideal for make-up removal, applying cleansers, astringents and lotions.Perfect for lint-free nail polish removal. Pads made of 100% cotton have been designed especially for the most demanding women. Thick, yet very delicate pads can be used for make-up removal, nail polish removal. For perfectly cleansed skin. Price: Due to the fact that all details & quotations are individually prepared, please contact us for obtaining trade offer.